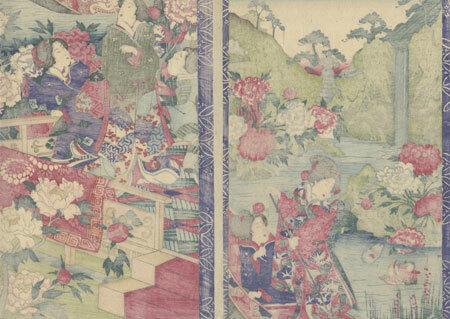 Comments - Lovely kakemono or vertical diptych of beauties enjoying a spring day in a peony garden. 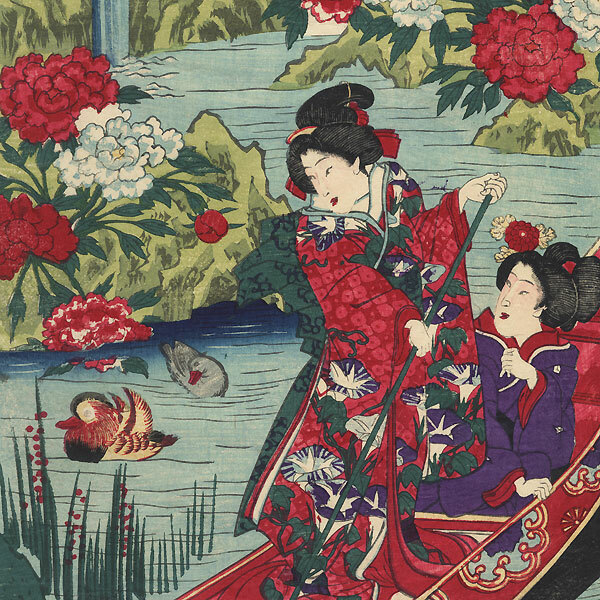 Near the bottom, three women relax on a verandah overlooking colorful blossoms in red, white, pink, and blue. Above, a beauty poles an elegant boat across the pond a pair of mandarin ducks floating nearby. At top left, a waterfall rushes over a steep hill, splashing into the water below. An attractive and colorful design with a decorative purple and white border. Condition - This print with excellent color and detail as shown. Two separate panels. Slight thinning at edges, small hole, repaired. Slight creasing, slight soiling at edges, stain. Please see photos for details.